Better Chef Coffee Grinder, Red by Prime Pacific Trading Company at Jakis Cafe. MPN: 4335456315. Hurry! Limited time offer. Offer valid only while supplies last. Better Chef coffee blade grinder in red will give you the feel of being your own barista. Buy fresh coffee and experience the aroma of fresh coffee. 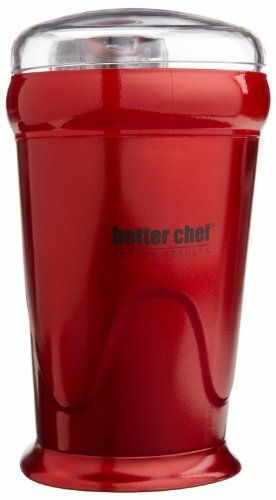 Better Chef coffee blade grinder in red will give you the feel of being your own barista. Buy fresh coffee and experience the aroma of fresh coffee. You can also grind spices and nuts. If you have any questions about this product by Prime Pacific Trading Company, contact us by completing and submitting the form below. If you are looking for a specif part number, please include it with your message.